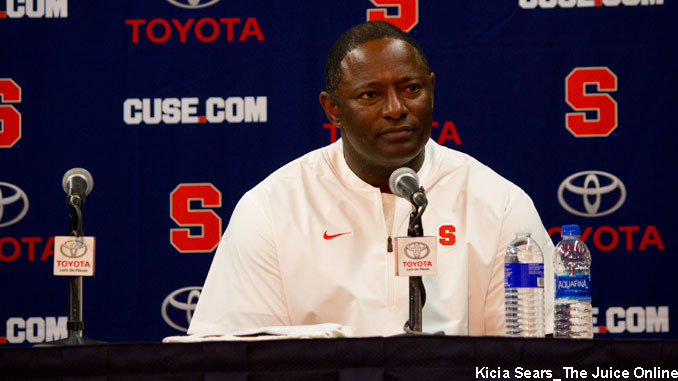 Syracuse head coach Dino Babers speaks with the media. Mandatory Photo Credit: Kicia Sears, The Juice Online. With another National Letter of Intent Day in the books, let’s look at where the Orange’s 2019 recruiting class stands. Dino Babers’ third year at Syracuse finally brought the success he’s been assuring would follow. The Orange finished the season with a record of 10-3. The only losses came at National Champion Clemson, in overtime at ACC Coastal Division winner Pitt, and against CFP participant Notre Dame at Yankee Stadium. Syracuse concluded the regular season by thumping Boston College, 42-21, and then beating former Big East rival West Virginia – albeit a depleted Mountaineer squad due to NFL decisions – in the Camping World Bowl. Babers and his staff, especially ace recruiter Nick Monroe, used that momentum to sign a solid December class before putting the finishing touches on their hard work and hustle yesterday. The Orange signed 17 commits – counting 2018 holdover Jawhar Jordan – back in the December signing period. Yes, the star ranking system needs to be taken with a grain of salt. But the rankings are the rankings and fans love to follow them to see which teams wind up with the best classes on National Letter of Intent Day. Plus, Syracuse’s success is attracting a higher caliber of player. This class consists of three 4-star players. Linebackers Lee Kpogba and Mikel Jones both earned a fourth star from Rivals while Florida safety Cornelius Nunn was recently awarded a fourth star from 247Sports. One area of depth that remains an issue with the current roster is the linebacking corps. This class addresses that need as three of the top four recruits are linebackers. Along with Kpogba and Jones, 3-star Geoff Cantin from Quebec rounds out a group that will certainly push for early playing time. The class hit some of the usual fertile areas Syracuse is accustomed to landing recruits such as Florida, Connecticut, New Jersey and Pennsylvania. But one new state where Babers is looking to strike gold is North Carolina. Syracuse landed three players from the Tar Heel state including its highest rated recruit in Kpoga. The Orange also secured signatures from defensive end Andrew Tuazama and cornerback Garrett Williams. Protecting Tommy DeVito from the onslaught of ACC defensive ends will be paramount to Syracuse’s success next season. That task becomes magnified as this year’s squad loses both tackles to graduation. So Babers landed a mountain of a man in Darius Tisdale from Lackawanna Community College. Keeping Eric Dunegy’s heir to the QB throne upright and operational will go a long way towards determining if Syracuse can match this past season’s success. Yes flipping way! Yes, as in, when it came to flipping recruits, that is. Really, what would National Letter of Intent Day be without a few flips? Once SU got Nunn back in the fold after a brief commitment to Miami, they went to work on other recruits. Connecticut quarterback David Summers committed to the Orange after deciding to part ways with Maryland once new coach Mike Locksley took the helm. Summers’ commitment became much more crucial once QB Chance Amie opted to add his name to the transfer portal. Syracuse again took advantage of a coaching change to land defensive end Jason Munoz out of Fort Lauderdale. Munoz had originally signed a letter of intent with Miami back in December. But the abrupt departure of Mark Richt caused Munoz to ask for and receive his release. Syracuse quickly swooped in and got Munoz on campus before he eventually committed at the end of January. One flip that didn’t go SU’s way was former defensive back Dorian Hewett. The Texan had been committed to Syracuse but opted not to sign inn December. Hewett committed to USC on Tuesday after taking an official visit to Los Angeles last weekend. Besides Summers and Munoz each signing a letter of intent, the Orange snagged two more recruits today. Steven Linton, a 6-foot-5, 215-pound 3-star defensive end out of Georgia, became the sixth player along the defensive line to sign with Syracuse. Linton joins Munoz, Tuazama, Cooper Dawson, Joe Rondi, and Ishmael Goulbourne. Syracuse also bolstered its running back brigade with the addition of 3-star Garrison Johnson from Manvel, TX. The Orange was in the market for another back with the graduation of Dontae Strickland. Syracuse’s ground game already looks to be in stellar shape next season with the return of Moe Neal, Jarveon Howard, and Oklahoma transfer Abdul Adams. Adams provided a glimpse of his abilities in the bowl win against West Virginia. Syracuse’s class currently ranks tenth in the ACC in the 247Sports Composite rankings. The Orange jumped three spots today with the additions of Linton and Johnson, moving ahead of Wake Forest, Pittsburgh, and Boston College. Now that National Letter of Intent Day is in the rearview mirror, Syracuse and Coach Babers can turn their attention to building the 2020 Class and the start of Spring practice.